With some of the variant covers for Darth Vader #1 by.. Greg Horn, Adi Granov, Alex Ross (he got two of them), Mark Brooks, Mico Suayan, Greg Land, Mike Del Mundo, Salvador Larroca, and Whilce Portacio. Warning: Contains more images than I've ever included in a single post before! 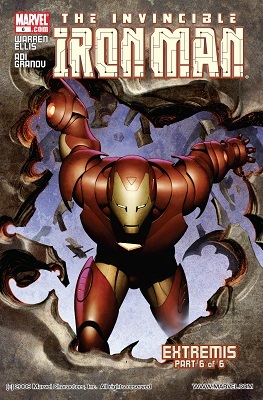 Question - What do Alex Ross, Alex Maleev, Sara Pichelli, Alan Davis, Pascal Campion, Pasqual Ferry, Joe Quinones, Simone Bianchi, Dave Dorman, Stan Sakai, Mike McKone, Dale Keown, Stephanie Hans, David Peterson, Mike Mayhew, Mike Deodato, Mark Brooks, John Tyler Christopher, Greg Land, John Cassady, Jenny Frison, Amanda Conner, Skottie Young and Bob McLeod have in common THIS WEEK? Answer - They ALL have variant covers of Star Wars #1 coming out... and that's not even all of them! 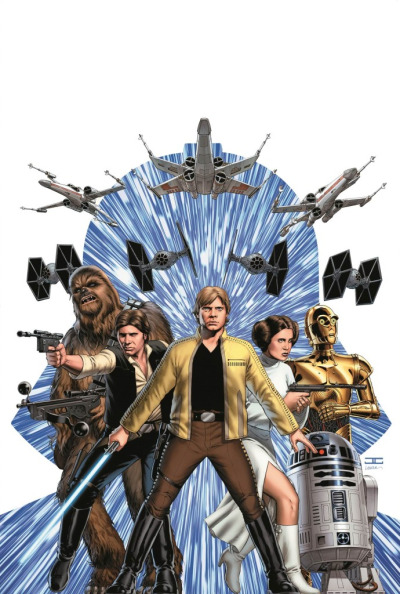 The release of Star Wars #1 from Marvel Comics this week is perhaps the publishing coup of the year, and you certainly can't say that Marvel and Disney and Lucasfilm haven't gone all out with the covers! One of the things I love about comics is the science. The stuff that makes no sense but looks beautiful (Jack Kirby!) to the stuff that makes a perfect amount of sense by people who have thought it through and taken ideas and concepts from now and projected them toward the future (Warren Ellis!). 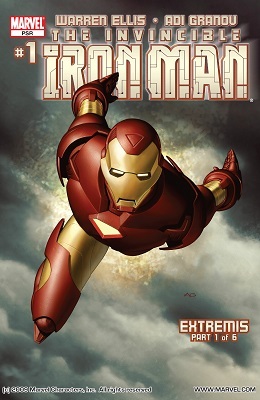 A great example of this is the Extremis process from Ellis' relaunch of Iron Man from a few years back. 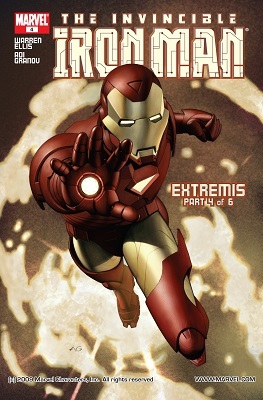 Here's a page from Iron Man v4 #3 explaining how Extremis works. 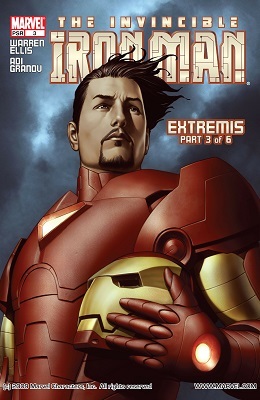 Last week, Marvel announced its plans to launch "AvX: Versus," a series set to run side-by-side with its event of the year, "Avengers Vs. X-Men." Now, the publisher has provided CBR News with an exclusive first look at artist Adi Granov's teaser for the highly-anticipated clash, featuring the Armored Avenger Iron Man tackling the Mutant Master of Magnetism: Magneto! A roundup of the X-Men news from C2E2 - not as much news as in some other places, but undoubtedly that's because of "Second Coming" still being only in the early stages. 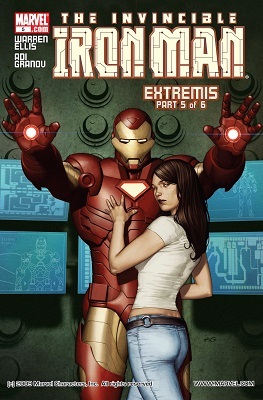 A look at the first issue of Black Widow: Deadly Origin, and its three covers. Together again, for the first time. News from Chicago concerning the futures of Agents of Atlas and Incredible Hercules. 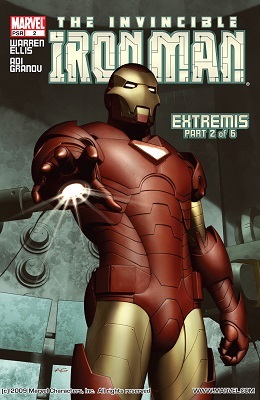 Four scans apiece from Dark Reign: The Cabal, relating to Doctor Doom, and from Ms. Marvel #38, featuring Moonstone.